Allow yourself to bask in the pleasure of the warm hospitality of our ground staff at Kharsoli, the helipad at Yamunotri. We have made reservations for you at the nearby hotel Shiv Shakti Eco resort. The 5.5 km trek to Yamunotri is considered quite perilous. We have arranged palkis to ease your effort. The entire round trip is for five hours and thirty minutes. After receiving a wonderful darshan from the Goddess Yamuna, you can easily make it to your resort where a delicious meal awaits you. Why don’t you consider including the famous Shani temple in the locale in your itinerary for the evening? Nicknamed as mini Switzerland, Harsil gifts one the pleasure of exquisite sensory indulgence in her beautiful vales. Gangotri temple situated at 22km from Harsil helipad takes about 50 minutes by car. While the Himalayan Nature Resort is located just at a distance of 2 km from the helipad. Pilgrims are advised to leave for their darshan directly from the helipad. Be reassured as our staff would assist you with all the practical details involved and will assist in your enjoying a blissful darshan. It is then time to relax and rewind at the resort. The campfire in the evening promises to soothe you into a refreshing sleep. But when you are at Harsil, you cannot miss the pleasure of taking a beautiful evening stroll in the adjacent village and procuring woollen cloth items – shawls, sweaters and mufflers-handmade by its talented womenfolk. At a 500m distance from the temple, the helicopter will land you. The brisk walk to the temple will take about 20 minutes. Kedarnath houses the beautiful jyotirlinga of Lord Shiva. There is an interesting legend about the inception of the temple. As per the legend, Pandavas sought reparation for their crimes against their own kin and family in the Kurukshetra. When Lord Shiva continued eluding them, the five brothers recognized his Leela in his adopting the form of a bull that wouldn’t let them approach it. The bull disappeared into the ground with only its hump above it. The hump-like shape of the Shiv linga worshipped in the holy shrine is attributed to the same. There hardly exists a suitable facility for night-stay at Kedarnath. hence it is advisable to finish the darshan quickly. We will have you stay at Guptkashi/Sitapur for the night. Also, why don’t you consider visiting the ancient Triyuginarayan temple in the evening? Legend has it that this is where Lord Shiva wed Goddess Parvati in their celestial marriage attended by devas and saints of all worlds. Hotel Sarovar Portico is situated quite close to the helipad at Badrinath. We will warmly assist you with the details of the darshan. The last Indian Village just before the border of China begins, Mana Village, is another tourist attraction in the area. 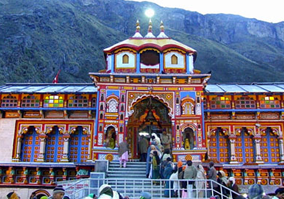 Badrinath temple is visited by thousands of pilgrims throughout the pilgrimage season to seek the benevolence of Lord Badrinarayan. The legend surrounding the temple’s inception has it that Nar and Narayan took no care of their mortal bodies while they were engaged in ascetic penances in the extreme weather. Goddess Lakshmi took the form of a beautiful Badri tree to shield them from the extremities of the harsh weather, earning it the same Badrinath. The special Abhishek Puja at Badrinath temple which begins at 4.30 am in the morning lasting for 2 hours is the most attractive highlight of all our offers in this entire trip. Being able to sit so close to the abiding deity and revel in His darshan for the ensuing two bhakti-filled hours is a rare treat indeed. The divinely auspicious trip ends at 12.30pm on the fifth day with the arrival of helicopter at Sahastradhara Helipad, Dehradun. One might reminisce all the beautiful memories we made on this journey began five days before. Hotel accommodation for 1 Nights at all Places. Pony/Palaki Charges service at Yamunotri. Local Transport for darshan and sightseeing at Gangotri and Badrinath. VIP darshan arrangement at all temples. Pickup & drop facilities to Dehradun Helipad. Landing & Parking charges at Sersi /Sitapur helipad. Ground Handling charges at Kharsali.